Now we come to greens. Green is the color of the Heart Chakra. What does the heart chakra do? It feels our feelings. It turns feelings into knowledge. It’s the place of love, all kinds of love. And it’s the place of grief and loneliness. Have you had your heart broken? Have you had your heart freeze? Has it burst with joy? What an active part of our lives! The heart chakra is always doing something! And here, in alphabetical order, are the greens. Get ready to experience new growth in your heart, Alana. 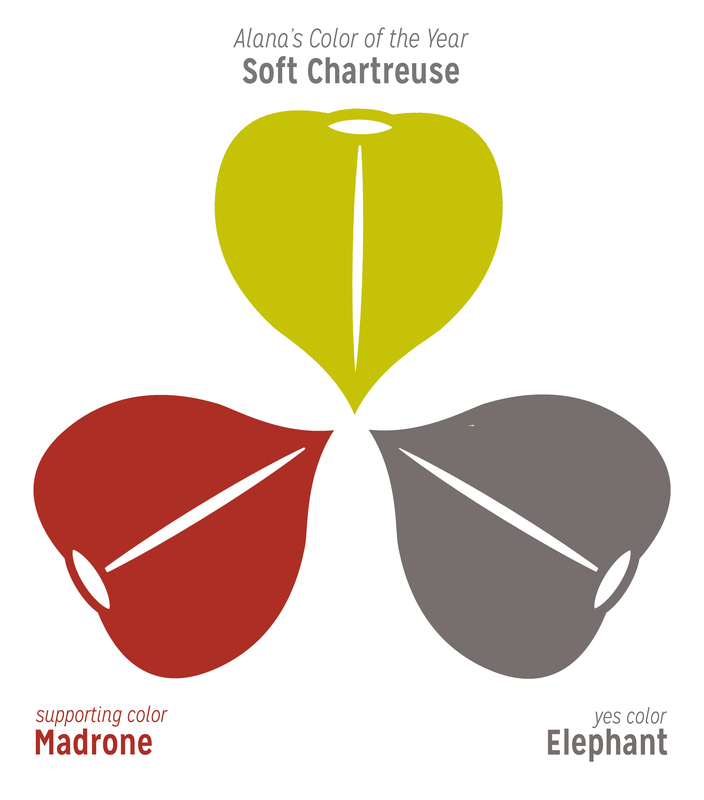 This soft chartreuse appears in nature in pistels and stamens, and in roots and shoots. It’s technically green which means it supports the 4th chakra- the heart chakra- but there’s so much yellow in it that we must take into account the 3rd chakra (power, self-perception, interaction with others). I am struck by the softness of this bright color. It’s like velvet. This downy brightness is the gentleness, the love that we have for our children and for our inner children. Wherever this growth appears, and for whatever it relates to, I give you one of my favorite support colors, Madrone. 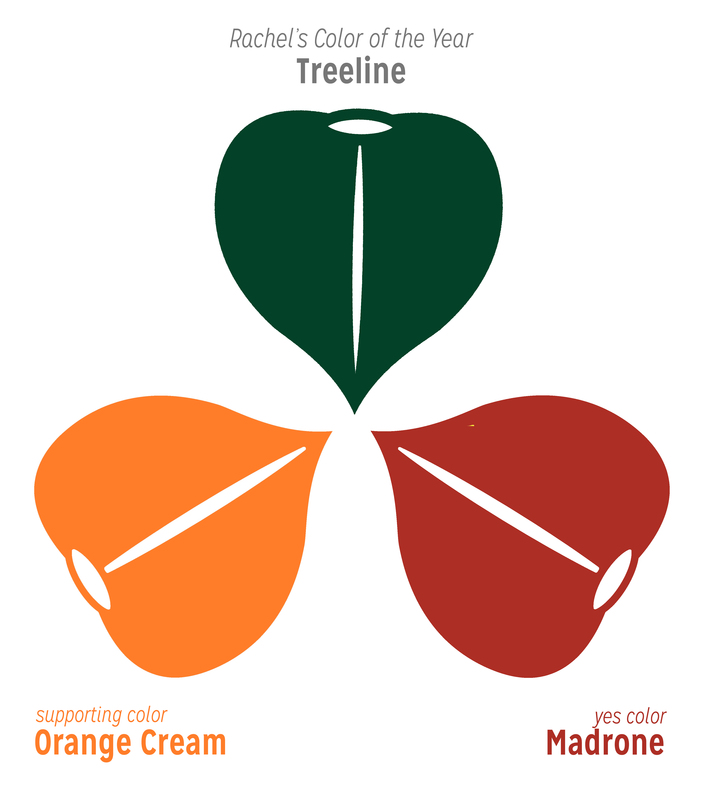 Madrone means fertile ground. It’s grounding and loving, taking the best of the 1st and 2nd chakras. Wear it when you want that extra loving support. And your Yes color– the color that means YES from divine source- it’s Elephant Grey. Elephant Grey means determination. So much love for you and what you do- Alana! This is a fundamental building year. It’s a year when a lot of things are going to become clear around love, speaking up about how you want to be loved, and listening to your loved ones to better understand their needs. It’s easy in the human realm, to forget our magic, and to forget that we are literally made of stars. It’s just really easy to think of ourselves as fumbling mistakes or as a series of random cellular divisions. 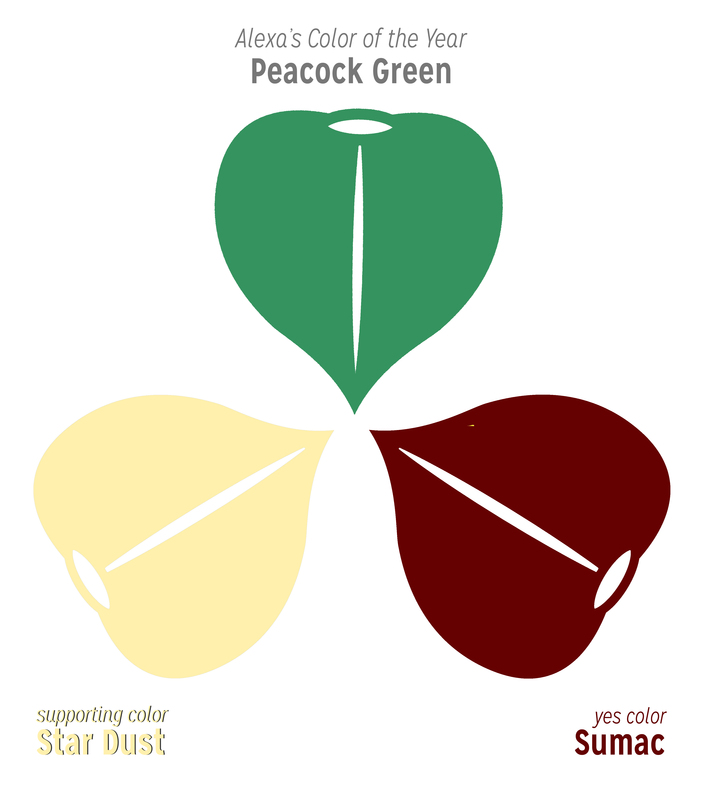 So when Star Dust comes forward as your support color, it’s a reminder to keep this understanding in the forefront. Stardust means, Connect to the Origin You are powerful. You are made of stars. Spending time getting to know your power and then applying it with love to your life, that’s what this year is all about. Sumac, your yes color,- this color protects and supports the second chakra- the place of creation. When you see this deep red-orange-brown, I hope it grounds you and helps you keep going. This is not a bad year, Alexa, but a challenging one. It’s one that you will, in hindsight, feel blessed to have (I hope!). Good Golly, Amalia! You sure know how to pick them! This color is so bright and so vibrant. It’s in your face. It’s fast and fleet. It’s a wild juicy green. This is the color of quick love affairs. It’s such a happy color. It’s a color to remind yourself to be in the moment with love. You don’t have to worry about whether love is lasting. You have to be concerned with whether you are opening yourself up to it. Open yourself up to love in the moment. 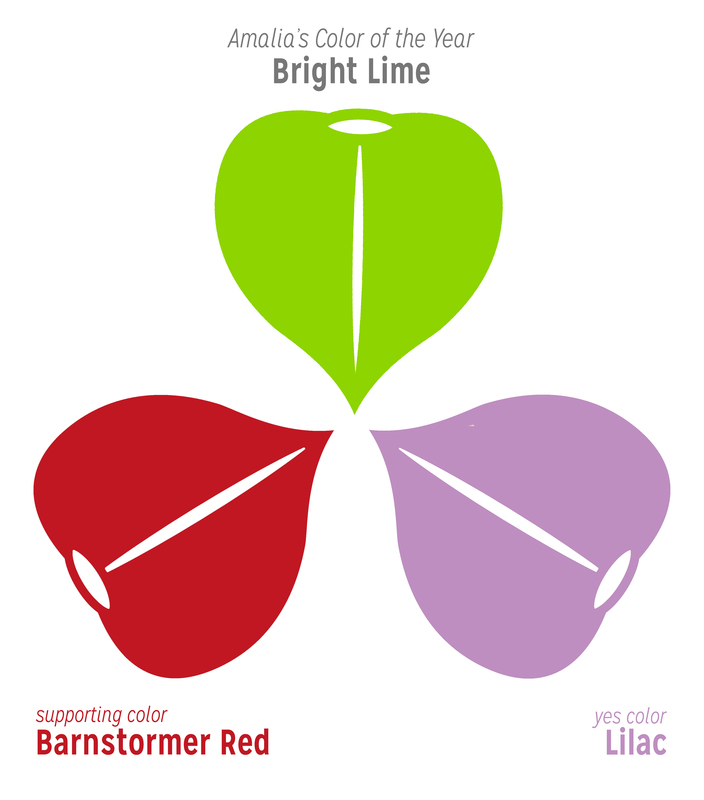 To support you- I give you Barnstormer Red- a bright cheery color, to remind you to Fly through the tight places. And your yes color- Lilac, which means Grace. Remember to look for it and remember to breathe! 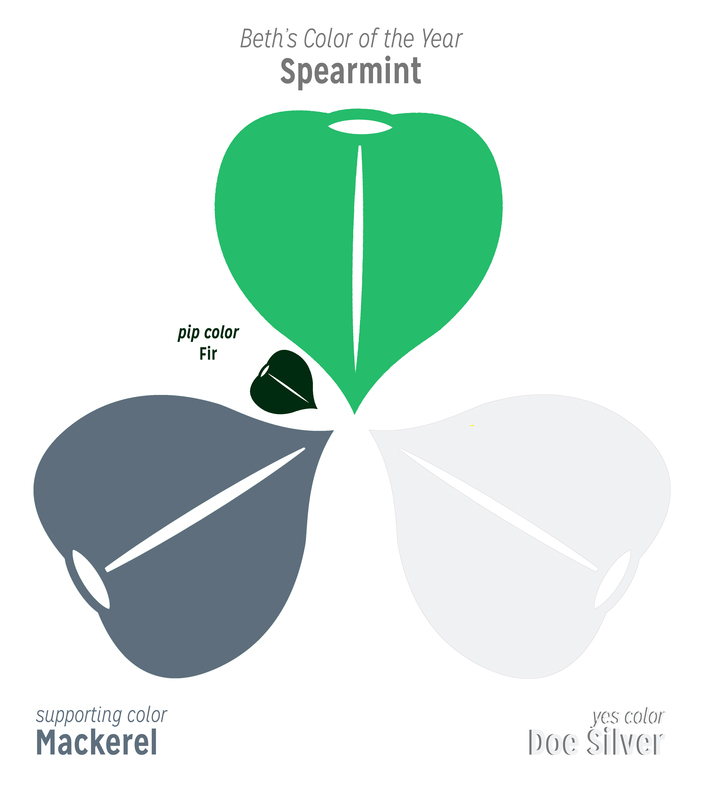 This is the deepest green. This is deep heart love. This is feeling the feelings at the deepest level. This is being connected at the deepest level. It’s a color that can feel like too much, and it shows up as a reminder of our depth and strength. I know that we are all going to benefit from you having this color. I think of the energetic pools you create, and your emotional depth, and I just know that the world is going to be better for it. And you too, you’ll be better for it. To support you, I give you Bluebird– this color means- gentle, persistent, honest communication. Wear it when words feel like they’re hard to find or express. And your yes color is Vibrant Iris, which means hope. Much love to you, Angela! I love your color. I love the vibrant nature of it. This is the color of an exuberant heart. I have spearmint in my garden. It grows whether I want it or not. I happen to want it. It grows all year. It grows under the snow. It’s always growing. Your color green is like that. It’s the exuberant growth of love in your heart. To support you, I give you Mackerel- which means, A Fertile Mind. Wear this color whenever you’re ready to pop out there with your good ideas. And, your yes color, a contrast, is Doe Silver, which means Stillness. Look for it, and breathe as you go through this exuberant year! Also, I thought I’d help give some depth to your year, with a pip. This is Fir Green, the deepest green. It means forthrightness. It’s a grounding heart color. Have a good year, Beth! Holli, your color is very close to Beth’s color, with just a bit more yellow, and a little bit of softness. Yellow means third chakra, so we’re talking love’s exuberant growth through interaction and self-perception. What I love about you is that you are so capable of sharing love, and you do so well when you do so in your writing, and your work, and in your personal life. You are a connector, and as you connect, you can pass your love onto others, and receive love back. So cool. To help you with this, I give you Bird of Paradise as your support color. Bird of Paradise means, A Clear Perspective. It’s a 2nd chakra color- think creativity and intimacy. Wear it when you want to be clear and to understand. Your yes color- another vibrant shade- is Gentian. It means Speak truth to power. I love this color, and I hope it reminds you of your brilliant connecting gifts! Hey sweet one, your color is so soft and muted. It’s a quiet experience with love. It’s gentle. Sometimes this color has some grief tied to it as well. How could it not? Sometimes we see what’s here with the reminder of what’s not here. It’s like stars. We could never pick them out without the negative space. I think your color points to a gentle loving year, a beautiful year of the heart. To support you, I give you Summer Night. This color is magic. Wear it to be reminded of the magic net of story and understanding of which we are a part, which is reflected back to us whenever we are out under the night sky. 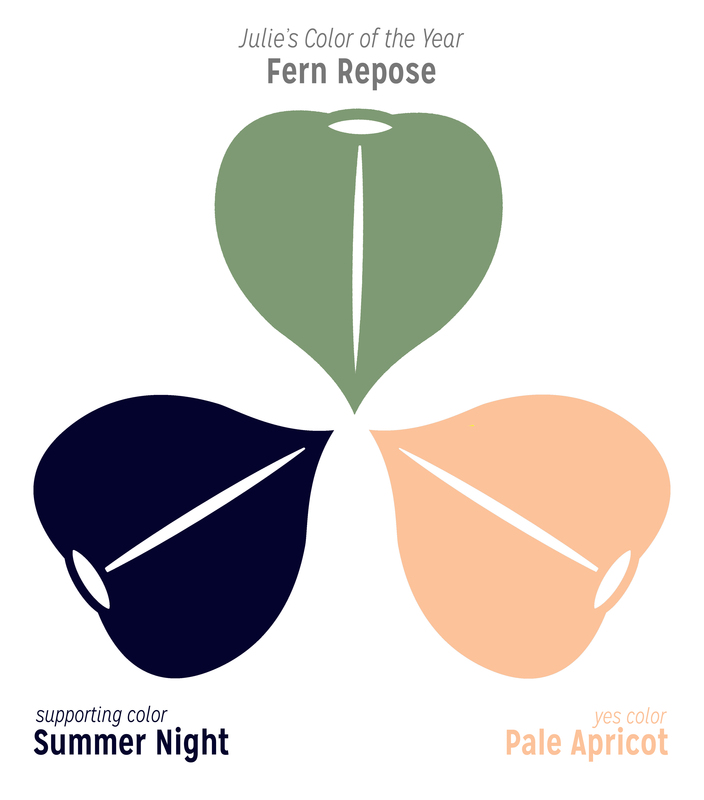 And your yes color, my friend, is Pale Apricot. It means deep intimacy. It’s the one-on-one color of heart connection and 2nd chakra sexual/sensual connection. Look for it. Julie- I can’t wait to see how this year unfolds for you. You’ll notice that your Color of the Year, and your support color are very similar. One is muted. One is both darker and brighter. I hope that this year you find and interact with both of these colors. Considering your January, I am so happy that your color of the year is Prairie Grass Green- a muted, quiet blue green that’s about heart-centered introspection. This year is a time that allows deep listening of your heart. To support you on this, I give you Blue Hosta- which means quiet rejuvenation. I don’t remember if you garden, Lauren-Miranda. I can’t imagine that you don’t. I hope you have a quiet place with hostas that you can go and sit and feel your body and spirit plump up with life’s energy. And your yes color, I was surprised to see this, but I love it- Sunrise– the gentle yellow-orange-pink- to remind you of new chapters and new moments and new understandings. Have a beautiful year, Lauren-Miranda! Rachel- you picked the color of a thawing heart. You were in a holding pattern there, taking care of so many in-the-moment moments. And now that life is rolling out again in a more expected fashion, your heart has time to go from a slightly dormant state to fully on. This will hurt. The pain is temporary. And the understanding that comes with it, it’s worth it. This deep color comes with a lot of opportunities for forthrightness, for working from a loving state. To support you, I give you Orange Cream– it’s goddess orange (and all the creativity, and grace and acceptance and mercy that goes with it) touched with white (endlessness). It’s such a great color. And, to give you a full-on yes, I give you Madrone– this color means Fertile Ground. It’s grounding. It’s gorgeous. And it’s here for you. I can’t wait to catch up with you over crepes at Mon Ami, Mon Ami! You also have a color that means that your heart is thawing. Expect a lot of feelings emerging as your heart fully wakes up. Like Rachel, I feel like this color brings a lot of opportunities for standing up for yourself, for forthrightness, for being truthful and clear. It’s a year for feeling the feelings and dropping the stories. It’s a year of being in the moment. Really being present to the love around you. To support you, I was so happy to see Zinnia come forward. This is the color of new ideas. It’s a vibrant alive color that will put your hands to work. And your yes color- it’s Sugar Maple, which means, Revel in the Season’s Sweetness. Have a lovely, green year, Rebecca! Here’s to a heartfelt year, everyone! So beautiful and eloquent! Felt some emotions bubbling up as I read!! yes!!! Can’t wait for Crepes!! You’re welcome! Well, I need to wait until our house gets sorted. But then we’re there! Such lovely colors, and such a fabulous supporting structure you’ve set up with this new COtY iteration Bridget. Oh wow. I am just now coming back to check. So much happening in the heart that my mind lost track of time. As always, I love what you’ve given me and look forward to watching the year unfold (and figuring out when and where to use my supporting colors!) Thank you Bridget. So much. Oh, Bridget. I only just found this now. Thank you so very much… I am very touched. It gives me some gentle (soft yellow) light of hopefulness and I’m still nursing my tender heart. Much gratitude and blessings.